Hi there! Today’s post is about 2 body products which I picked up at Poundland – Baylis & Harding Beauticology Pink Grapefruit & Raspberry Body Butter and Fragrance Mist. I’ve been using these products on and off since mid-January, and here’s what I think. Baylis & Harding Beauticology Pink Grapefruit & Raspberry Body Butter is very nice! Whilst it feels a bit sticky (it’s not too bad, I promise), I am not complaining because this body butter feels deeply nourishing. It also takes a minute or two to absorb, but I don’t mind because the result is beautiful skin that feels super soft and well hydrated. This is a great body butter! Baylis & Harding Beauticology Pink Grapefruit & Raspberry Fragrance Mist promises to refresh and hydrate skin. I’m happy to confirm that it keeps its promise. The fragrance mist smells and feels very refreshing. I also like to spray it down my back because it’s hydrating. What else? 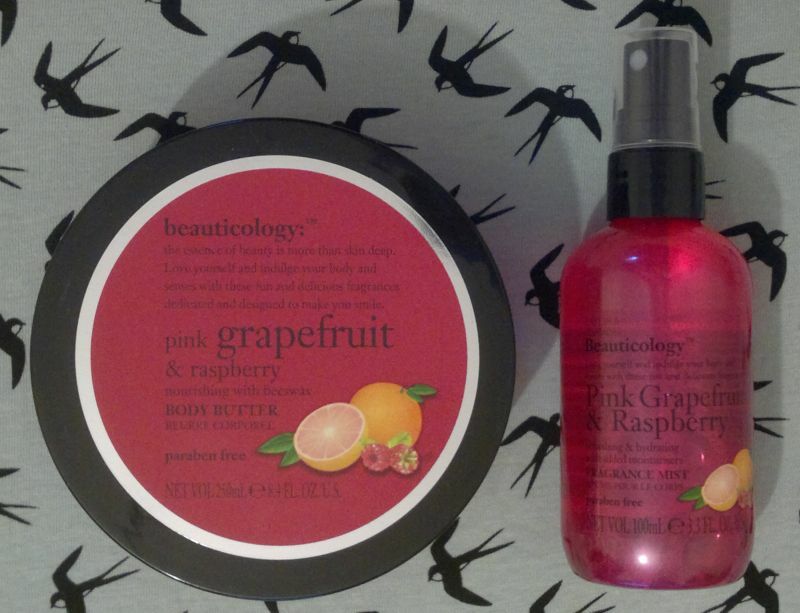 The fragrance of these 2 products is definitely a lot more raspberry than grapefruit. I would have preferred it the other way around, but I do like the fresh raspberry fragrance of these products, so I have no reason to be unhappy. Based on my experience, I wouldn’t hesitate to recommend these products. Baylis & Harding Beauticology Pink Grapefruit & Raspberry Body Butter is available as 250ml. Baylis & Harding Beauticology Pink Grapefruit & Raspberry Fragrance Mist is available as 100ml. I paid £1 each (Poundland). Hi there! Today’s post is about Baylis & Harding‘s Mango & Mandarin Fragrance Mist which I picked up a few weeks ago. This fragrance mist promises to refresh and hydrate the skin – and that’s exactly what it does! I don’t know how it works, but this spray feels very fresh, almost cold, when it hits the skin. The cooling effect lasts for a few seconds, and it’s really nice. I’m happy that the spray feels hydrating. I like to spray it down my back after the shower. It makes my skin feel soft and silky. Brilliant! I think the fragrance itself is very pleasant because it’s refreshing, fruity and tangy. I’ve been enjoying it a lot over the past couple of weeks. Great stuff! Baylis & Harding‘s Mango & Mandarin Fragrance Mist is available as 100ml. I paid £1 (Poundland). I’ve also seen matching body products (shower gel, shower scrub, body butter). 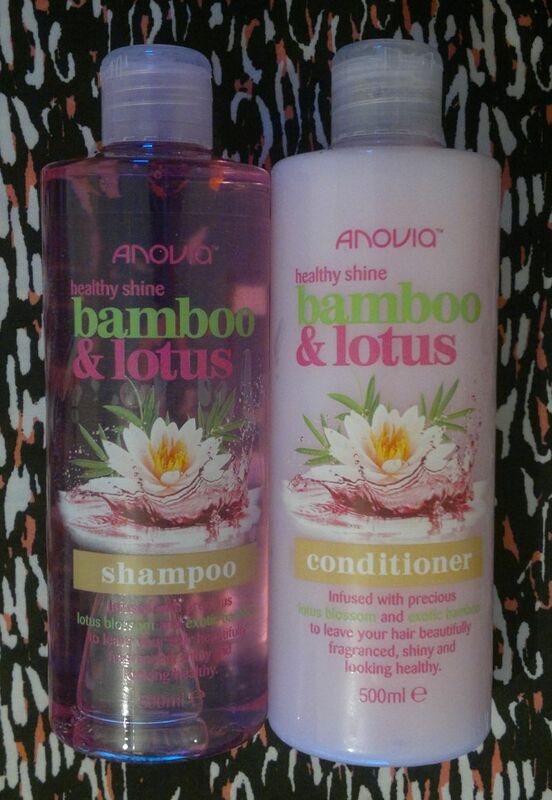 Anovia Bamboo & Lotus Shampoo and Conditioner – 500ml bottles for 99p each (Home Bargains). 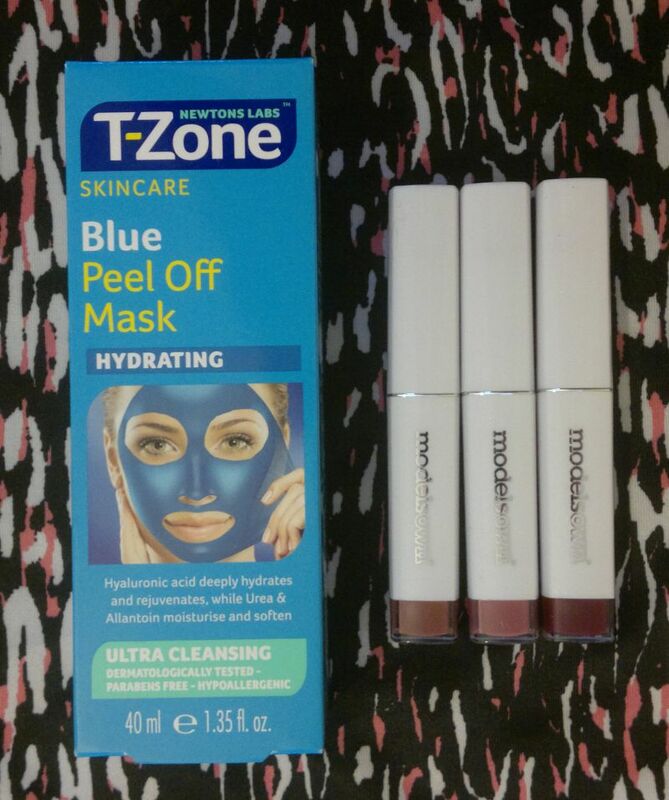 T-Zone Blue Peel Off Mask (99p, Home Bargains), and 3 Models Own Hipstick Sheen Lipsticks – Naked Brown, Retro Pink, Deep Plum (£1, Poundland). 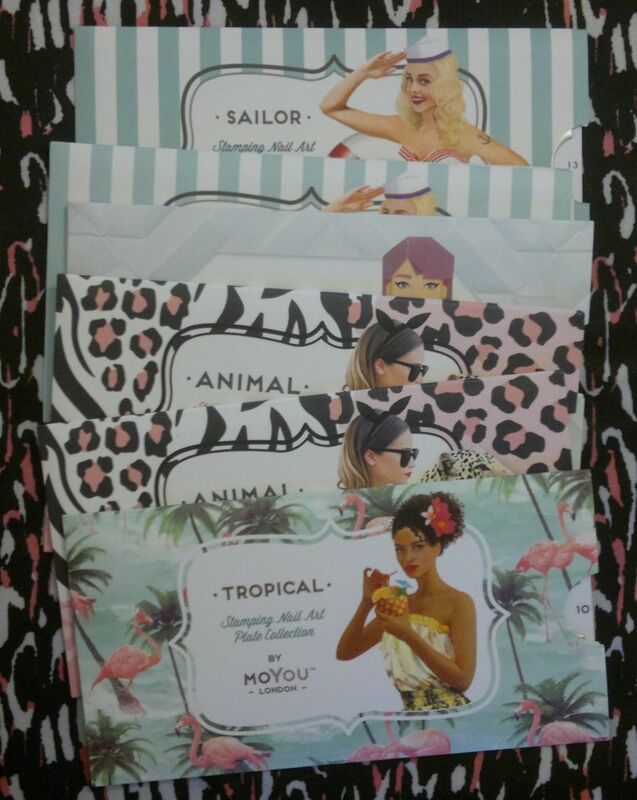 New MoYou London stamping plates – Sailor 06 & 13, Origami 06, Animal 03 & 07, Tropical 10 – these were £2.99 each. New MoYou stamping polishes – Little Pickle, Scandi Sun, Genie In A Bottle, Alpine Rain, Cancun Coral, Powder Blue, Orchid Chic – these were 2.99 each. I must say I found the customer service at MoYou London really poor. There were several issues with my order. The customer service agent didn’t read my emails properly so there were a few pointless exchanges, and because of this it took over a month to sort out my order. I also found it extremely lazy and unprofessional that she didn’t start or finish most of her emails with any kind of salutation. 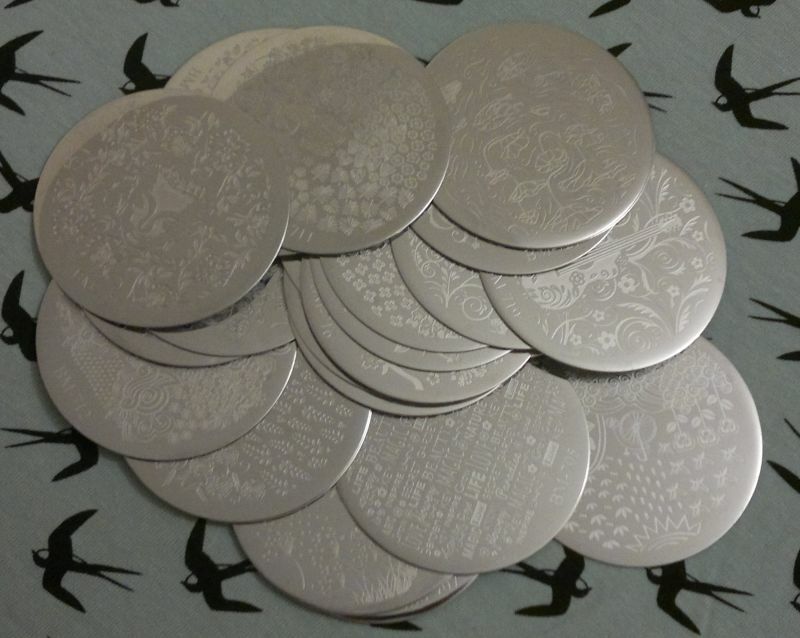 … and I purchased Bundle Monster‘s sensational Secret Garden stamping plate collection – £17.62. What a bargain! I purchased this set through Nail Art UK. Great service! And I found Baylis & Harding‘s Pink Grapefruit & Raspberry Body Butter and Fragrance Mist. These were £1 each at Poundland. I’m very happy with what I bought. Have you tried any of these products? Would you like to try any of them? Feel free to get in touch. And thanks for reading! Hi there! Just last weekI told you that I bought a 3-piece Baylis & Harding gift set. I just couldn’t resist the Donuts theme. Yes, I know I’m weak! 🙂 I’ve already given these products a try, so here’s what I think. 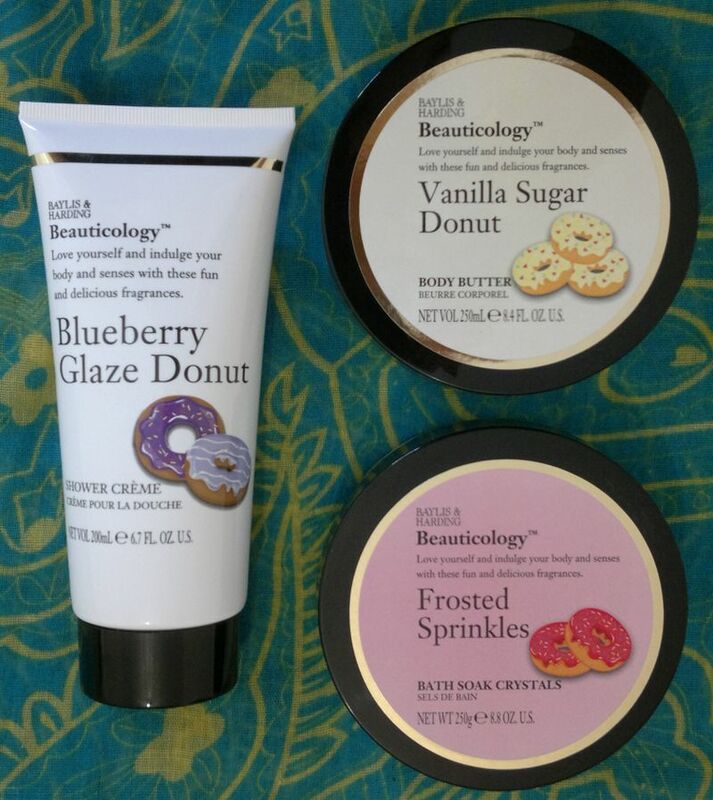 Baylis & Harding’s Beauticology Vanilla Sugar Donut Body Butter moisturises my skin well. The vanilla sugar donut fragrance is rather faint, but I have to say that it’s very authentic! Baylis & Harding’s Beauticology Frosted Sprinkles Bath Soak Crystals are a nice treat. I think the Frosted Sprinkles fragrance is inredibly sweet and rather strong, but it smells like the perfect mix of frosting and sprinkles! All in all I am happy with these fun products. I paid £6 (Asda) for my Baylis & Harding Beauticology Donut set (which, I think, would also make a cute gift). Have you tried these products? If so, please feel free to let me know how you liked them. And thanks for stopping by! Hi there! Some of you may remember that I used to buy toiletries, skin care and make-up in bulk. But I’ve stopped doing that a few months ago. Since then my approach to shopping has been 3 out / 1 in, which is going surprisingly well, so I’m sticking to this approch until (at least) the end of the year. 🙂 OK, I haven’t done much shopping lately, and because of that I’ve built up some “shopping credit”. So I decided to treat myself to a few new products. Now let me show you what I bought! 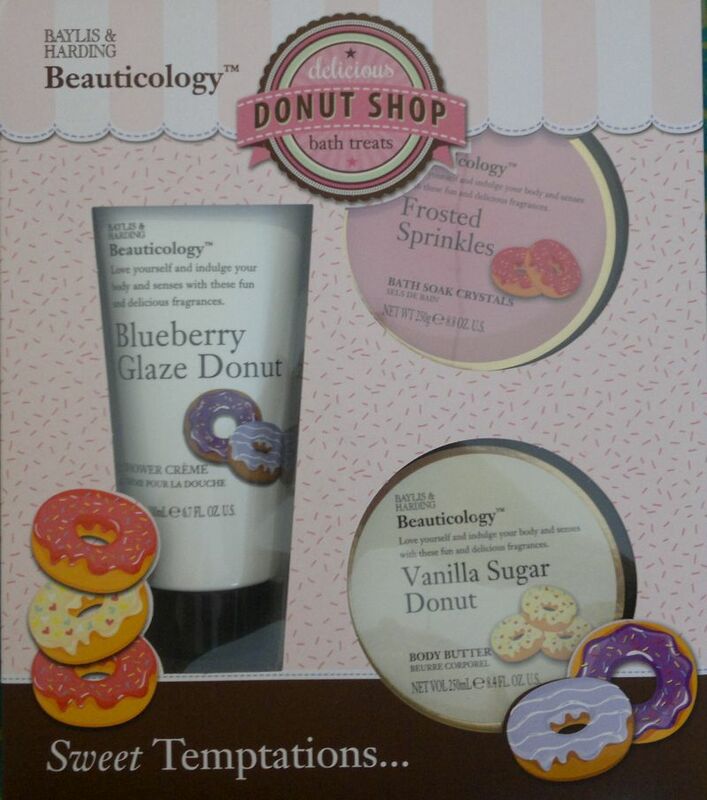 I found this Baylis & Harding Beauticology Donut Shop gift set at my local Asda store. It was £6 and it contains the following full size products: Blueberry Glaze Donut Shower Crème, Frosted Sprinkles Bath Soak Crystals, Vanilla Sugar Donut Body Butter. Yummy! 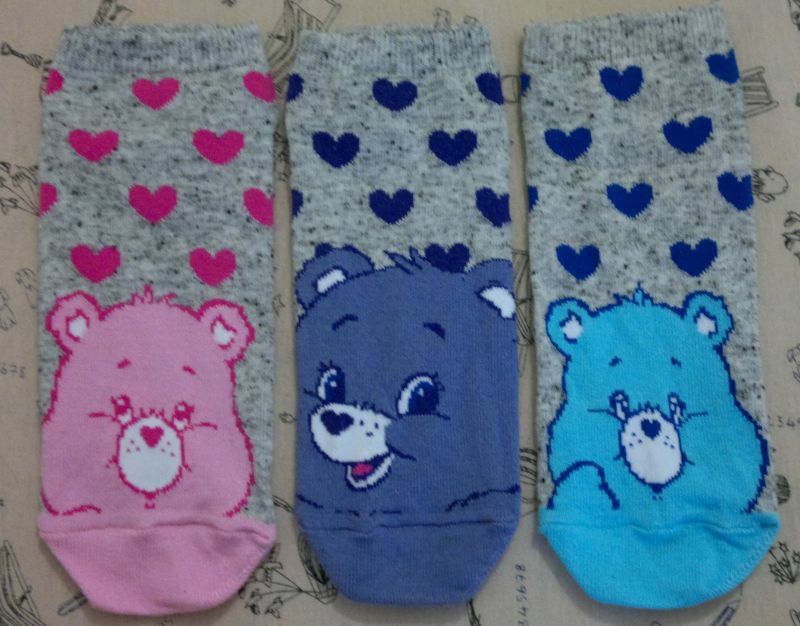 … and a set of 3 pairs of Care Bears socks. No, clothes and accessories have nothing to do with the 3 out / 1 in policy / approach / thing. 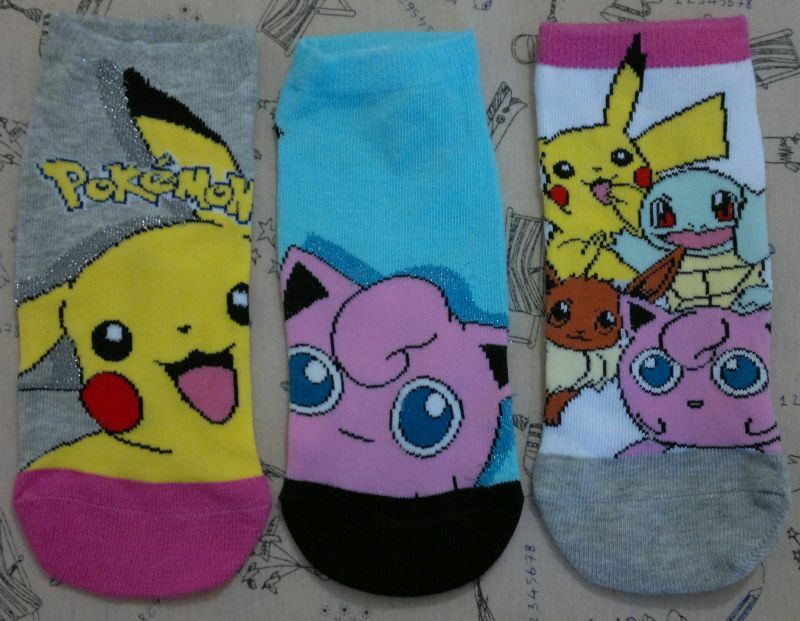 However, I still wanted to show you that I bought these super cute trainer socks. 🙂 OK, now let’s get back to the toiletries and the beauty products that I picked up from Boots and Superdrug! I bought 2 Carex shower gels. Carex used to do hand soaps and hand gels only, but they’ve recently launched shower and bath products too. 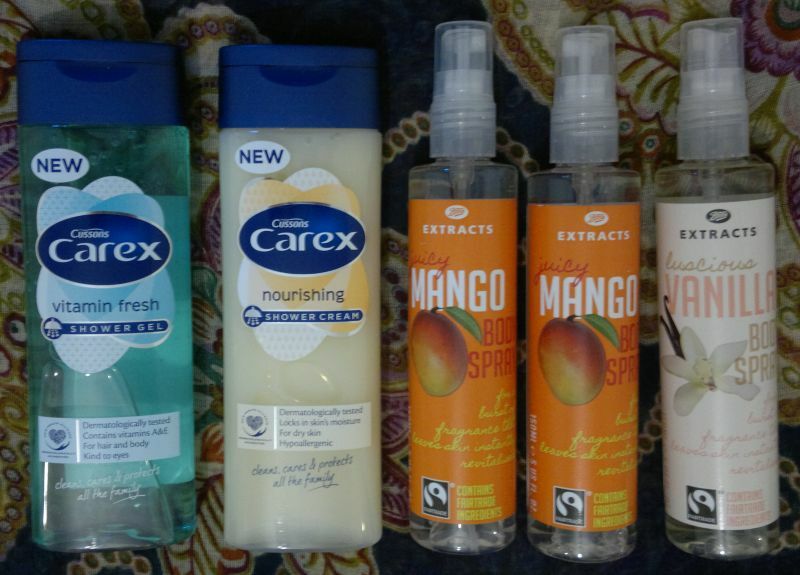 These Carex shower gels were £1 each (special offer, Boots). I also bought 3 Boots Extracts Body Sprays – 2 mango sprays and 1 vanilla spray. These sprays are £3.50 each, but Boots ran a 3 for 2 promo, so I spent £7 in total for these 3 fantastic body sprays. 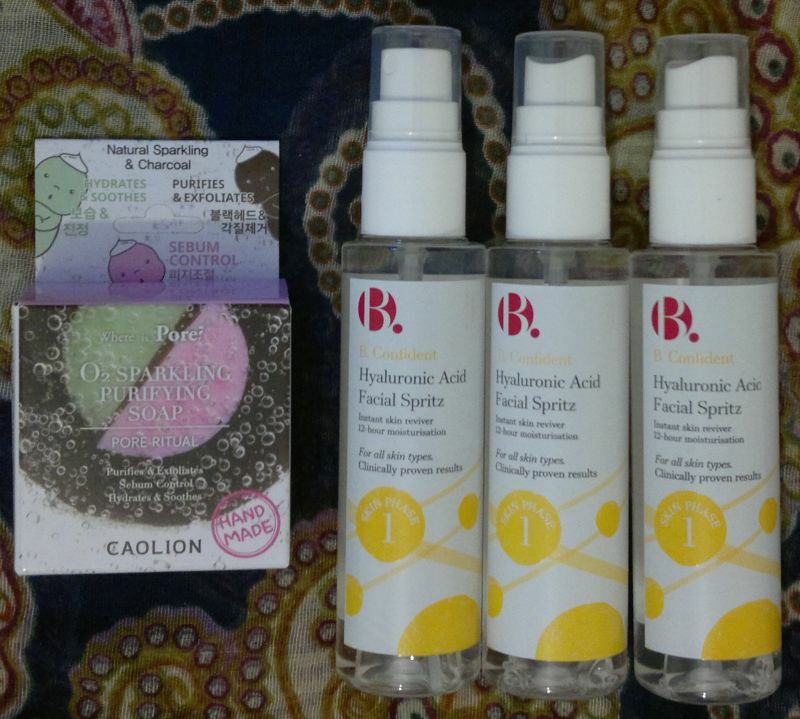 I found this super cute Caolion O2 Sparkling Purifying Soap by accident. I wasn’t looking for it. I didn’t need it. But it was £4 (Boots) and it looked cute… I wanted it, and I bought it! I also bought 3 more B. Confident Hyaluronic Acid Facial Spritzes. They’re normally £7.95 each, but they were on special (half price), so they were £3.95 each. However, Superdrug also ran a 3 for 2 promo on selected skin care products, so I paid £7.90 in total for these 3 body spritzes. Fantastic value! 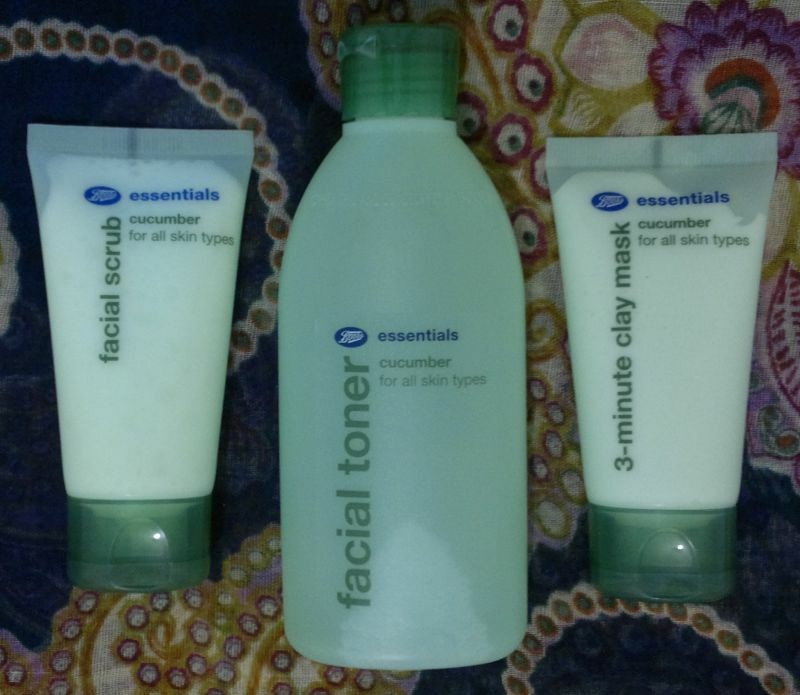 I bought 3 more items from Boots’ Essentials collection – a Cucumber Facial Scrub, a Cucumber Facial Toner and a Cucumber 3-Minute Clay Mask. I’m really looking forward to testing these products! Hi there! My last treasure hunt 😀 led me to my local Home Bargains store where I found quite a few lovely products. Two of them were Baylis & Harding’s Skin Spa Rose, Ylang Ylang & Patchouli Hand Wash and Hand Lotion. I paid £3.98 in total for two 500ml bottles – bargain! The hand wash is very gentle to the skin. It doesn’t feel harsh or drying at all. The hand lotion is definitely one of the better ones I’ve had this year. It moisturises my hands nicely without feeling too sticky on the skin. Now let me get to the Skin Spa scent. When I tried the hand wash for the first time, I thought the patchouli note was too smoky and too strong in general. However, only moments later the rose and ylang ylang notes began to shine through – absolutely lovely!